Lasers are devices that amplify light by stimulating photon emission. By minimizing diffraction, lasers create a very narrowly focused pencil beam of highly coherent, high intensity light. The beam can be directed with great precision to any spot, where it heats the target area to the desired degree. Lasers may use gas, chemicals or a glass rod doped with ions to generate the energy state required to stimulate photon emission. The various types of lasers produce light with different wavelengths and degrees of coherence, giving users the ability to choose the ideal tool for each application. Chemical lasers provide very high levels of power and are generally used for military and industrial applications. Gas lasers vary widely in power and function based on which gas is used to power them. Helium neon lasers are used in optical labs and research, while CO2 lasers are for cutting and welding in industrial applications. Other gas lasers are used by hobbyists and for spectroscopy. Specialized gas lasers called excimer lasers are used for LASIK eye surgery as well as for semiconductor lithography. Solid state lasers, which create photon-generating energy states by doping glass rods with various ions, are used for different purposes depending on which ions are used and the power and spectrum of the resulting beams. Neodymium lasers are used for cutting and welding metals as well as for spectroscopy. Very high power solid state lasers are used in optical fiber surgical devices. Extremely short pulses are directed through the optical fibers and used to resurface joints, vaporize cancers and dissolve kidney and gall stones. 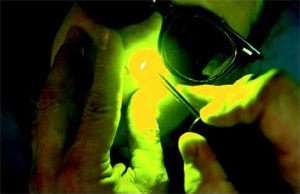 Other specialized types of lasers that are used for diagnosing and treating medical conditions include diode lasers, free electron lasers, optical parametric oscillators and diode lasers. Used for surgical procedures, lasers provide greater precision than even the smallest scalpel, enabling surrounding areas to remain unscathed. Laser procedures result in less blood loss, less discomfort and less scarring than traditional procedures, and reduce the incidence of infection. Lasers are also used in medical imaging, hair and tattoo removal and angioplasty.